Inspired by her far-reaching travel as an air hostess, Reiko decided to make a career from cooking and teaching by introducing Japanese cuisine to her foreign friends living in Japan. Reiko then moved to London and set up a company called HASHI to cater for Japanese dinner parties. 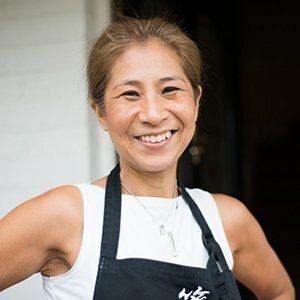 Many of those whom Reiko catered for asked if she could teach them how to cook, resulting in her growth as an authentic Japanese cookery school. Over the past 13 years, Reiko has set thousands of students on the path to creative and accessible Japanese cooking, coaching a range of talent from raw beginners to cordon bleu-level chefs. She has featured on programmes such as Good Food Live and The Great British Kitchen, working with notable chefs John Torode, Gino D’Acampo and Hardeep Singh Kholi. In 2011, Reiko released her first cookbook, Hashi, A Japanese Cookery Course, which she declares to be her greatest achievement to this day. She also enjoyed success at the 2012 British Cookery School Awards and was named a finalist in the People’s Choice category. You can find out more about Reiko at her website. Cook Japan, her new book, was published by Bloomsbury in 2017.